What is this? The ZenPad? Yes, correct, that’s what we are all about! This may very well be the relaunch of the Asus tablet lineup. In the past, we’ve seen many different brandings for the Asus tablets, like Eee Pad, Eee Note, Eee Reader, etc. Lately though, we’ve seen Asus pushing with one solid brand, and that’s the Zen brand. We’ve seen that with the Zenfone, which Asus is very much pushing in 2015 and beyond, and now we are seeing ZenPad as being something new for 2015 and beyond. 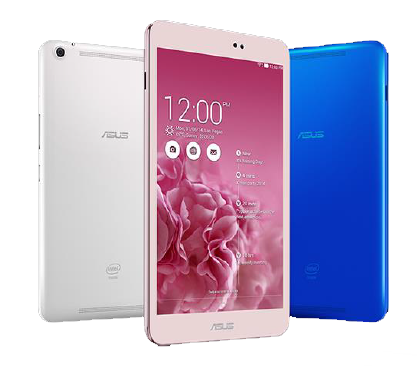 So what exactly is the Asus ZenPad? At this point, there is only really speculation by the tech community. In an early 2015 Asus financial report, they first mentioned the ZenPad (see photo below). Beyond that, there aren’t specs or details. We can suggest a few possibilities right now though. It appears that the ZenPad is powered by an Intel processor. You can see the Intel logo on the reverse side on the photo below. This relationship that Asus has with Intel is strong and Android devices from Asus have often been powered by Intel processors. Intel is making big moves to becoming a bigger player in the mobile market with new and improved Atom processors. The MeMO Pad series has been powered by Intel and we don’t see that changing. Some tech journalist are speculating that the ZenPad is replacing the FonePad. Perhaps, but perhaps not. Looking at the photo, there doesn’t appear to be the features that would indicate that you hold it to your face. We see rear stereo speakers, and not front facing like we’ve seen in the FonePad from the past year or two. In fact, the tablet used in the Asus slide is in fact the MeMO Pad 8, and clearly it’s not the MeMO Pad 7 nor is it the fonepad. These are just our guesses of course. Although the “ZenPad” will brand all tablets moving forward, we wonder out loud how Asus will differentiate the Android tablets from the Windows tablets. That is why we are leaning towards Asus keeping the “MeMO” and the “Vivo” aspect of the branding. How could they have a ZenPad 7 only, especially if they are coming out with a Windows version as well as an Android version? Having model numbers like ZP701 or ZP702 are simply not going to be clear enough to consumers. In that sense, branding will play an important role moving forward. Let’s see what Asus decides to do. On the flip side, there is also the possibility that the MeMO Pad line-up continues and that the ZenPad will be the more premium products. That ultimately could great too many sku’s, but you just never know. Asus don’t have fear when it comes to launching products. Can the ZenPad and the MeMO Pad exist in the same market? Time will tell. We can confirm that during the investors conference, Asus did confirm that ZenPad will be their tablet brand moving forward and that they will be reducing the number of models. Great news for Asus and a good strategic decision. For the North American market especially, having a consistent name is important to consumers. Think about Apple. It’s one tablet. It’s the iPad. That’s it. Sure there is the “mini” and the “Air”, but iPad is the base of the brand. With Asus using ZenPad, a similar strategy can be implemented and there is no reason for this not to be a smashing success for them. So what else can we garner from the photo of the upcoming ZenPad tablets? Clearly there are stereo speakers, which is terrific to see. We’ve already mentioned the Intel logo, meaning Atom processors. We also see a shift in the camera position. Asus is taking a page out of the iPad Mini and Nexus 9 design book. Perhaps this is just a trend with tablets, to have the camera corner positioned as a standard among smaller mobile devices. Asus typically, as in always, offers expandable storage with microSD card slots. This is a great added value and is a big reason why these tablets are the ones to buy vs. the non expandable Nexus tablets. There is a chrome edge on the ZenPad tablet shown above, which is likely to be a featured style of the brand. Certainly the chrome adds an elegant look, which is part of what “Zen” means to Asus. Based on what we’ve heard thus far, do not expect there to be a second tablet brand, such as “MeMO Pad”. It does not appear that ZenPad is the premium line. It’s the only line. Asus isn’t likely to charge premium prices, but they are certainly not getting into the race to the bottom. As discussed by Jerry Chen, Asus CEO, the white box manufacturers can always get a lower price point. Asus can’t compromise quality for the race to beat the lowest price. So in summary, it will be one brand name, fewer models, and a reasonable but not inflated pricing. It’s possible that there could be a ZenPad Pro series, so those interested in a premium priced tablet, although that pure speculation on our part. No doubt this is a great move by Asus. I have the me302c and hope to update this year. Big hopes for some great tablets from asus in later 2015. I’m skeptical at this point. I’ve found their branding confusing. So many varieties but can never find official accessories when I need them. Step up and improve in NA please! !